GATE Syllabus is based on the different stream according to the qualifying examination. IIT Madras has define GATE syllabus in this year according to the 23 papers. These will be conducted for admissions to the M.Tech programmes which is offered by the IITs and IISC. The GATE syllabus 2019 will be same according to the previous year. The national level engineering entrance exam will be conducted for post graduation courses on February 2rd & 3th and February 9th & 10th, 2019. Candidates need to review GATE syllabus 2019 for the stream that they will be appearing for.The syllabus defines that what are the topics their subtopics they need to prepares for the appearing examination.Candidates can download GATE syllabus 2019 from below given table where the syllabus are given for every stream. The syllabus is the very important part of the examination because it plays an important role in the examination. GATE exam will conducted for 23 (Stream) Papers. For each discipline syllabus is different. For a good preparation, to know each and every topic from where the questions will be asked is important . 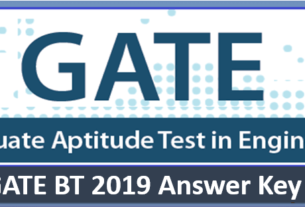 Describing the complete syllabus of GATE in overview to difficult but Candidates can download the GATE 2019 syllabus for AE, AG, AR, BT, CE, CH, CS, CY, EC, EE, EY, XE, GG, IN, MA, ME, MN, MT, PE, PH, PI, TF and XL from the official site. If we are talking about the preparation tips then every time and every experts says in the second terms that candidates needs to review their GATE Syllabus for exam preparation. Every year lac of candidates will appear for the examination in their respective stream. However, its totally depends upon the candidates that to choose any of the GATE papers as per their preference for admission in M.Tech programme , while they need to check their eligibility criteria of the M.Tech programme where they avail admissions.